This time we make a visit to “MOR Happiness” in Kichijoji, a popular area about fifteen minutes west of Tokyo’s Shinjuku Station. From the station, a fifteen minute walk brings you the store, which happens to be located right near the ever-popular Ghibli Museum. Originally a part of the Trueberry Juice Bar, MOR Happiness has been spun off into its own entity as of November, 2016. Incidentally, a number of sweets made here can also be found at Trueberry and at the weekend Farmer’s Market in the tony Aoyama district of central Tokyo. 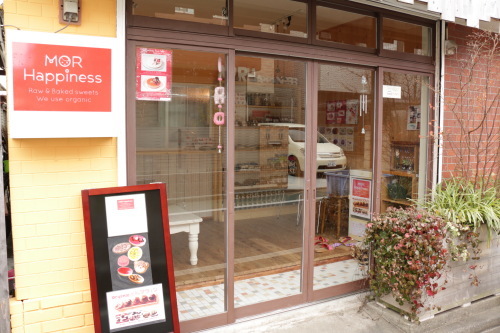 MOR Happiness’ specialty is making sweets without the use of dairy products or eggs. All products are also certified to be gluten-free, which is a relief for allergy sufferers. Additionally, the use of white sugar is eschewed, with GI-friendlier maple syrup, coconut sugar, coconut nectar, agave syrup, etc. being enlisted instead. Baked sweets are made with beet sugar and yacon syrup. Keeping blood sugar levels down wherever possible is a priority! Source materials are, whenever possible, certified organic. The store also functions under a core belief that even sweets should maintain a focus on nutritional value, and their actions reflect this. On the average day, a full twenty varieties of sweets are on sale, but on Fridays, when the baked sweets are also put on offer, this number climbs to a very impressive thirty varieties! 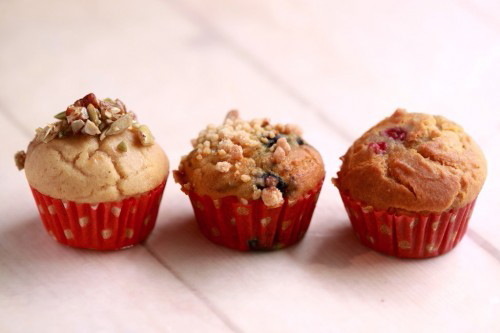 The most popular items are the white and brown rice flour, gluten-free muffins (360 yen apiece). It is quite common to see people walking around the outdoor marketplace picking up a muffin or two for an impromptu snack. Customers have remarked that while other companies’ small muffins must be eaten in multiples to satisfy, just one MOR Happiness muffin satiates – and does so quite happily. 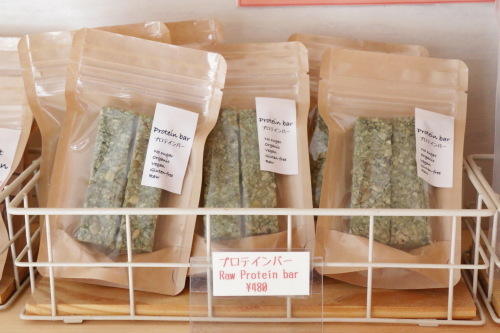 Protein bars (480 yen) are yet another popular item. Naturally, these protein bars are also organic, not made with refined sugars, and are gluten-free. Here we have the brown rice apple ginger cookies (380 yen). Within the store’s vast selection of low-sugar goodies, this stands out as being the one with the lowest sweetness of all. Brown rice aromas, faint apple sweetness, and accents of ginger come together in beautiful harmony. Not just for women, this treat is sure to be a hit with men as well. 1 You are what you eat. 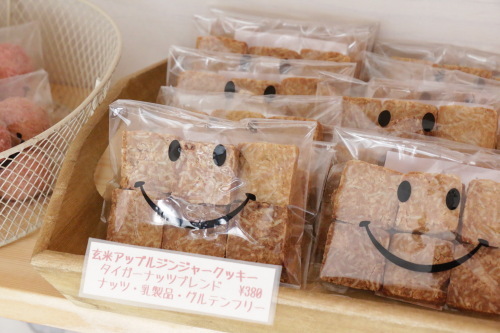 MOR Happiness wants to make people happy with their sweets. 2 What does the “MOR” in “MOR Happiness” stand for? You are what you eat. 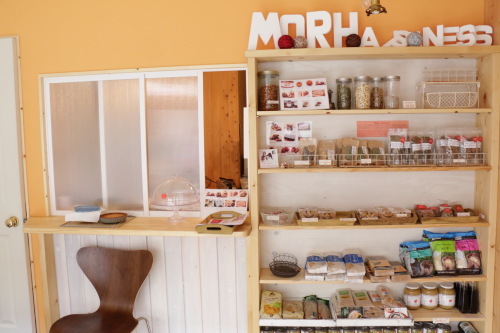 MOR Happiness wants to make people happy with their sweets. We sat down with MOR Happiness’ founder, Mikano Katayama for a discussion about the beliefs that drive their business. Prior to the MOR Happiness venture, Mikano Katayama worked as a beautician. While toiling to keep people looking beautiful, she realized the impact the food they were eating was playing on the beauty of their skin. In her additional work as a Pilates instructor, she would hear from her customers about their beauty and diet worries. All this together brought around Mikano’s realization that beauty and health blossomed from the inside of our bodies, and that merely working on how we look vis-à-vis skin care and the like was not the answer in whole. From here, Mikano decided to give raw food veganism a try, and also quit eating refined sugars. After three weeks, she noticed remarkable change in her physical condition. Her low energy levels were gone, as were her headaches, and even her tongue was experiencing different sensations. In our world today, there are many women who, while not manifestly sick, feel as though their body is in poor condition. With even small change in diet, Mikano wishes to share with people the multitude of health benefits that may be gained. It is from this credo that she and her friend got to work on Truberry and then MOR Happiness, both serving as vehicles to connect with others in delicious, healthy ways. You are what you eat. MOR Happiness wants to make people happy with their sweets, but also wants these sweets to be an impetus for changes that lead to healthier living. Mikano Katayama wants to share her healthy lifestyle beliefs as manifested through healthier sweets. What does the “MOR” in “MOR Happiness” stand for? M is for Mind, O is for Organic, and R is for Relax. 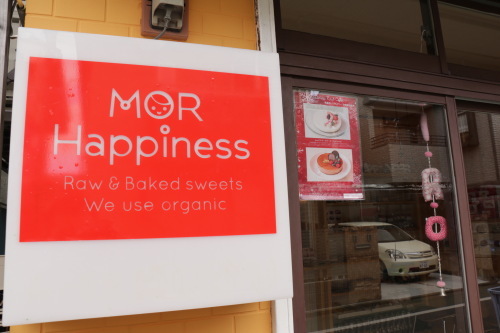 Through the sale of their sweets, they hope to bring Happiness to their customers, so it is with all this in mind that they created the name “MOR Happiness” for their shop. MOR Happiness delights in making lower sugar sweets. While most people associate this palate profile with women, MOR believes that their delectable goods are also a perfect fit for men who are sensitive to overly sweet baked goods. Further, allergy sufferers who are not being served by MOR Happiness’ current selection are encouraged to inquire about with the staff. No matter how seemingly selfish the request may be, the staff eagerly await the opportunity to discuss options with their customers! Along these lines, the shop is soon to begin selling a nuts-free collection. As I have sat here at my PC writing this article, the hour has slipped beyond midnight. Off to the side, acquired during today’s visit to the store, sits some brown rice apple ginger cookies. Even at this time of night, however, I don’t feel bad about my failure to resist temptation as I gobble the remaining morsels down. It certainly is the case that MOR Happiness’ baked goods are not as sweet as store bought varieties. Those with a sweet tooth may find that MOR’s sweets are, well, not quite enough to quench their sweets desire. Yet, for me, in eating these conscientiously and fastidiously prepared goodies, I find a satisfaction greater than a fleeting sweetness could ever provide.